I think this nursery rhyme sums up last Wednesday’s game vs Magdalen College School. 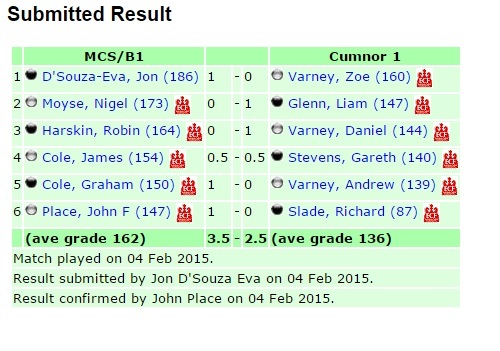 But let’s start at the beginning of the evening, MCS/B1 had a very strong team. I am guessing they had seen our recent results against Witney 1 and Bicester 1. As normal, I order this on how we finished but 2 hours 35 minutes into a 3 hour game, no one had finished. I was the first to finish after 2 hours and 38 minutes played. I got a little lucky, I was a pawn down and had to lose a second just to try and get some counter play. Nigel looked like he played a smart move, pinning my Knight but he did not look far enough ahead and I won his Knight. Gareth was down a pawn for most the game but ended up holding the position in the endgame. Gareth got it down to Bishops and a wrong rook pawn, click here for explanation. Zoe was on top board after her rapid grade rise, the position was too complicated for me to analyse and Zoe did lose. Richard played very well against John who is 60 grading points above him. However, John had more active pieces against Richard’s King and delivered a checkmate. I did not see much of Daniel’s game as I was notating Andrews game, as he was down to less than 5 minutes. But in the endgame Daniel got a pawn promoted and had many threats against Robin’s King which was more than enough to win. With the match level at 2.5-2.5 it all went down to the last game. Andrew made a great effort to get to the match and both players had only minutes left while still in the midgame. A time scramble ensured but Andrew’s clock ran out of time first. The final score was 2.5-3.5, a close match but a loss for Cumnor. ‹ ECF releases latest chess grades – how did you do?